PARIS --- The statements on BAE Systems’ 2017 results, released by the company on Feb 22, provide an interesting update of its ongoing military aviation programs, and also provide a number of information “nuggets” that have not hitherto been released. One such fact is that the first Hawk jet trainer assembled in Saudi Arabia is due to fly this year, and another that Qatar is due to make its first payment “by mid-2018” on its order for 24 Typhoons and their £1 billion weapons package provided by MBDA. Reading these statements, readers may legitimately wonder why this information was not released at the time of the event. -- In December, BAE Systems and the Government of Qatar entered into a contract, valued at approximately £5bn, for the supply of 24 Typhoon aircraft. Alongside supplying the aircraft, the agreement provides for the supply of ground support to the Qatar Armed Forces and delivery of technical and pilot training in Qatar. The contract is subject to financing conditions and receipt by the Group of first payment which are expected to be fulfilled no later than mid-2018. -- In , 20 Typhoon aircraft were delivered from the UK final assembly facility, of which four were delivered to Saudi Arabia, completing the contract for 72 aircraft. -- All 236 Tranche 2 aircraft have been delivered to the UK, Germany, Italy and Spain, together with 51 of the 88 contracted Tranche 3 aircraft. -- There were eight Typhoon and eight Hawk aircraft deliveries to the Oman customer in the year, with the remaining four Typhoon aircraft scheduled to be delivered in 2018. -- Good progress continues to be made on airframe manufacture for the contract to supply 28 Typhoon aircraft to Kuwait secured by Italian Eurofighter partner, Leonardo, in 2016, with fuselage deliveries (to the final assembly line in Italy—Ed.) due to commence in 2018. -- Development towards the Royal Air Force Centurion standard continues, which will enable transition of air capabilities from Tornado to Typhoon. Flight testing for Storm Shadow and Meteor weapons capability enhancements was completed during the year. Integration of the Captor E-Scan radar continues. -- We have continued to support our UK and European customers’ Typhoon and Tornado aircraft and their operational commitments. The ten-year partnership arrangement with the Ministry of Defence to support the UK Typhoon fleet continues as planned, with availability of aircraft being sustained at contractual levels. -- The initial support package has been substantially delivered as part of the contract to commence operations at a new operating air base at Adam in Oman. -- full contract award was secured on Lot 10 and 82 rear fuselage assemblies were manufactured for the Low-Rate Initial Production Lot 10 and 11 contracts. Negotiations continued on Lot 11, with additional order intake received in the year of £248m. Lot 11 negotiations are expected to conclude during the first quarter of 2018, with the balance of the order intake also expected in this timeframe. -- At RAF Marham in Norfolk, good progress has been made on construction of the engineering and training facilities and the stand-up of the operational service in readiness for the arrival of the UK’s first F-35 Lightning II aircraft in 2018. -- Following the announcement that the UK had been chosen as a major European repair hub for the maintenance, repair, overhaul and upgrade of F-35 Lightning II avionics and components, we have established a joint venture with the UK Ministry of Defence and Northrop Grumman, and progress on establishing the repair facility and capability continues to plan. -- Support continues to be provided to users of Hawk trainer aircraft around the world. The long-term support contract for the Royal Air Force’s UK fleet of Hawk fast jet trainer aircraft continues to deliver against all contractual milestones. -- Discussions continue with the Government of India and Hindustan Aeronautics Limited (HAL) for the supply of additional kit sets which will result in aircraft built under licence by HAL for the Indian Air Force and Indian Navy. -- An initial contract for the Anglo-French unmanned combat air system feasibility and definition phase of £16m was received during the year. It is anticipated that an Anglo-French follow-on programme will be agreed in 2018. -- A £119m contract was secured for collaboration on the first design and development phase of an indigenous fifth-generation fighter jet for the Turkish Air Force. -- On the Salam Typhoon programme, with four deliveries in the year, all 72 contracted aircraft have been delivered to the customer. Typhoon capability development programmes continue to progress. -- The Typhoon support contracts are operating well and a contract for support to additional flying hours was agreed in April. -- Discussions have continued with the Saudi Arabian customer though 2017, resulting in contractual agreements under the Saudi British Defence Co-operation Programme to provide ongoing support services to the Royal Saudi Air Force and Royal Saudi Naval Forces for a further five years to 31 December 2021. -- Final aircraft deliveries for the first batch of 22 Hawk aircraft were completed in the second half of the year. 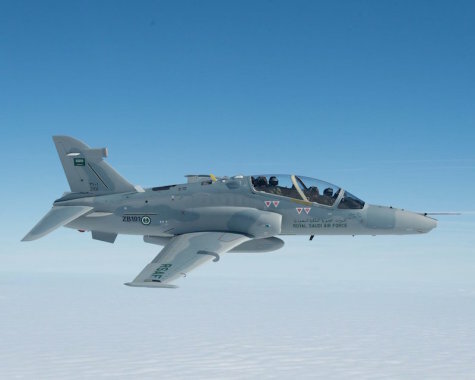 The first major units of the second batch of 22 aircraft, contracted in 2015, have been delivered on schedule to Saudi Arabia allowing final assembly to commence. -- Under the Royal Saudi Naval Forces’ Minehunter mid-life update programme, acceptance of the third and final ship is expected in the first half of 2018. -- Under the planned reorganisation of our portfolio of interests in a number of industrial companies in Saudi Arabia, Riyadh Wings Aviation Academy LLC acquired a 4.1% shareholding in a Group subsidiary, Overhaul and Maintenance Company, during 2016 and is expected to acquire a further interest up to a maximum of 49%. The reorganisation supports our strategy to expand the customer base of our In-Kingdom Industrial Participation programme, promoting training, development and employment opportunities in line with the Kingdom’s National Transformation Plan and Vision 2030. -- The Saudi Arabian In-Kingdom Industrial Participation programme continues to make good progress. During 2017, there has been further capability and knowledge transfer on the Typhoon and Hawk platforms. The first Hawk aircraft assembled in Saudi Arabia will come off the production line in 2018 for delivery to the Royal Saudi Air Force. (This reveals that license-production has been delayed, as in August the first deliveries were expected in the third quarter of 2017, according to Arab News—Ed.). -- We have commenced discussions with the new Saudi Arabian Military Industries (SAMI) organisation to explore how we can collaborate to deliver further In-Kingdom Industrial Participation. All of these activities are aligned with our long-term industrialisation strategy, as well as the Saudi Arabian government’s National Transformation Plan and Vision 2030. -- The Oman Typhoon and Hawk aircraft programme, being undertaken by Platforms & Services (UK), completed delivery of the first eight Typhoon aircraft and all eight Hawk trainer aircraft in 2017. The remaining four Typhoon aircraft are scheduled to be delivered in 2018. -- Separately, we continue to fulfil our legacy industrial participation obligations in Oman through delivery of an agreed training and knowledge transfer programme. -- In March, MBDA secured a contract from the UK and French governments for a three-year concept phase of the Future Cruise/Anti-Ship Weapon, which will prepare for the replacement of the existing missiles deployed by the UK and French armed forces. This contract follows on from the joint UK-France 2016 programme for the mid-life refurbishment of their current inventory of missiles. -- In July, MBDA finalised the financing package to secure effectivity of the Qatari contracts signed in 2016, which will supply air defence systems and anti-ship missiles for the naval surface fleet along with coastal defence systems. -- The German Ministry of Defence and MBDA have entered into a formal negotiation process for the German ground-based air defence system, TLVS, a key element of the German defence strategy. Lockheed Martin will be the joint venture partner with MBDA on this programme. -- Significant progress has been made in securing positions on a number of fast jet platforms. The Meteor Beyond Visual Range Air-to-Air Missile is already in operational service on Gripen with the Swedish Air Force and has now achieved qualification for both Typhoon and Rafale aircraft. -- A contract has been received to procure further Brimstone missiles to equip Typhoon. -- Lightning II has progressed well, with successful Advanced Short Range Air-to-Air Missile qualification firings achieved and contracts received from the UK to integrate Meteor. -- In December, MBDA entered into a contract with Qatar for the supply of Brimstone and Meteor missiles. The contract is subject to financing conditions and receipt by MBDA of first payment which are expected to be fulfilled no later than mid-2018. -- Success in both domestic and export markets has significantly increased MBDA’s production volumes resulting in the requirement to expand production capacities. A new manufacturing facility is fully operational in Bolton, UK, and a capacity enhancement is under way in Bourges, France.